Known as the most expensive metal after gold and silver, tin is very malleable and flexible. Though having nearly the whiteness of silver, it does not rust easily nor will air tarnish it readily. It is significantly antibacterial, and also known as a material with high heat conductivity. NOUSAKU uses pure tin. It is common to add other metallic materials to provide durability and facilitate cutting work, but NOUSAKU uses tin without such additives. Pure tin ware is hygienic, washable and safe for serving foods. Accumulated experience of skilled craftsmen enables us to produce these unique pieces. KAGO series are items capitalizing on flexibility of 100% pure tin. Pull and extend the product up and down, so that it will become a basket. Unique crackling sound called Tin Cry may also be heard. 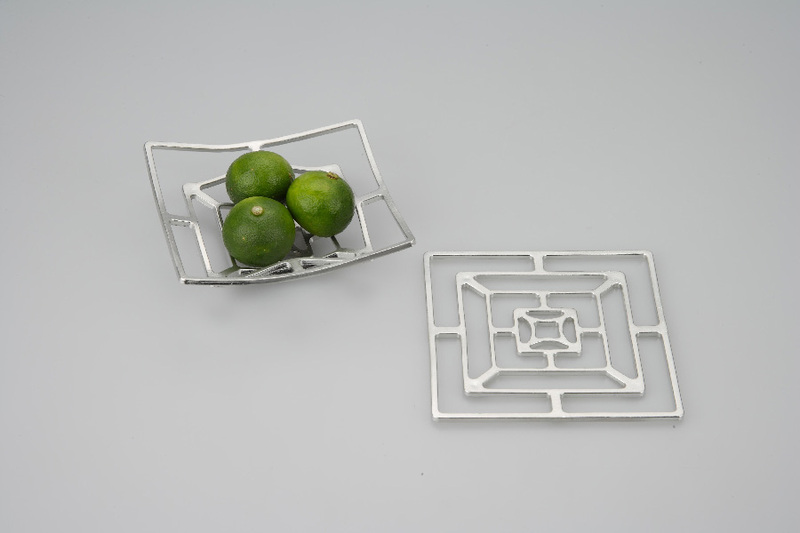 Enables you to enjoy the product in multipe ways; as a small fruit/vegetable basket, decoration for the vase, or a small bowl on top of ceramic plate.